A multi-level insider’s look at the changes transforming contemporary Iran. 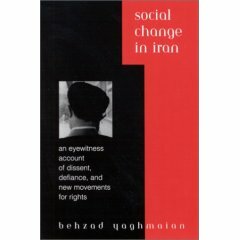 Social Change in Iran is an inquiry into the recent changes in Iran, blending scholarly analysis, eyewitness accounts, and the author’s personal experiences. It tells the stories of everyday people, be it young men and women challenging the cultural and social mandates of the Islamic Republic, or workers toiling at multiple jobs to overcome harsh economic realities. This passionate homage to the people of Iran as told by a native is a glimpse into the human feelings and aspirations of a people subjected to varying forms of violence at home and widespread misunderstanding abroad. At the same time Yaghmaian provides an informed analysis of the widening political divide within the state, and the emergence of a movement for reform, both of which have shaken the seemingly indisputable foundations of the Islamic Republic.